Mommy/Me Matching Swaddle & Gown : For the cutest newborn photos either in the hospital or soon after getting home. If the Mommy-to-be loves taking photos, then she will LOVE this one. 2. 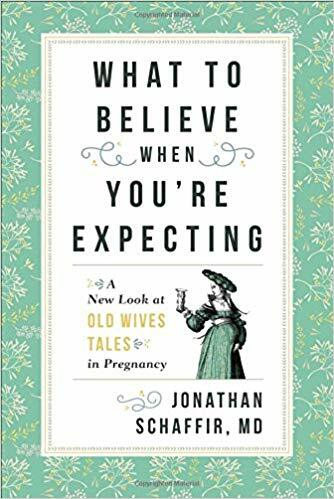 For the Mom That Loves To Read: “What To Believe When You’re Expecting” : This book goes into detail from OB-GYN’s perspective on the things we are told works from conceiving, pregnancy, labor, after birth and even breastfeeding. What is a tale and what is true? This book will go into detail to help sort through all the “tales” swirling around online and in the world of motherhood. 3. Car Seat Canopy / Breastfeeding Cover : This is a MUST-have for new moms. Babies need to be covered and what I have found is that this amazing for breast-feeding as well. This is an item that they will thank you for months later. 4. 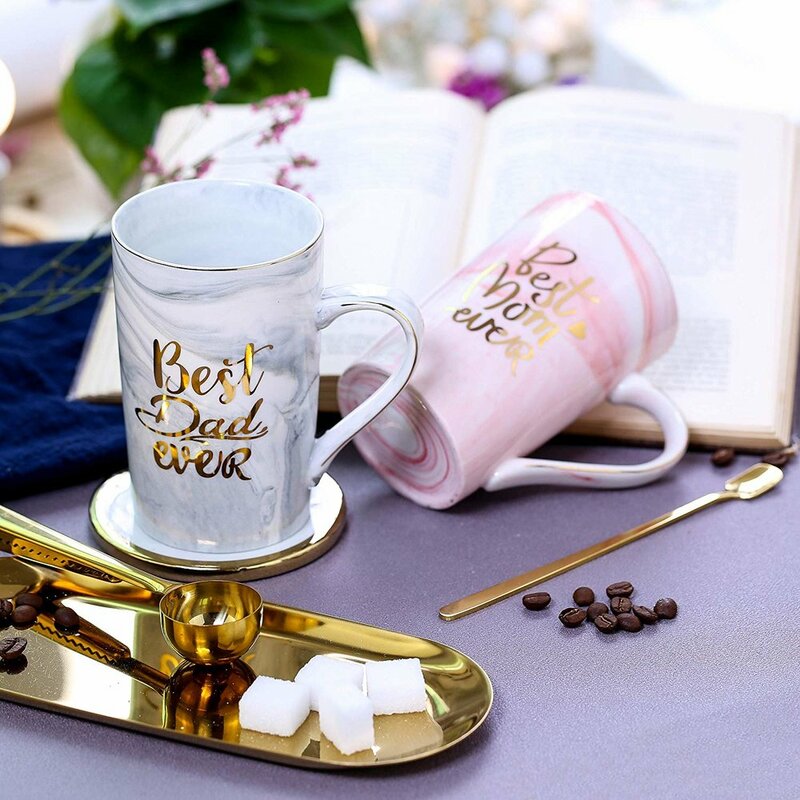 Mom & Dad Mugs : Most of the items on our baby shower list is for the baby, but this one is definitely for the mom and dad. They will appreciate this in the most precious way. 5. Monthly Milestones Blanket! These little babies grow SO fast. Every month happens and this photo will be cherished forever. Definitely a great gift item! That’s it! Comment any suggestions you have below! Would love to get your feedback! A Smoothie Recipe For Pregnant or New Moms To Get More Energy! Takes all of 5 minutes to do and you will feel better right away! Disclaimer: As always please consult your doctor before trying anything. I am not a doctor. It has been 4 years since we built our home. This poor bathroom has remained pretty empty looking for all those years so this year, I decided to upgrade our bathroom as simple easy process. This wall was pretty much empty. So here is what it look like now, sorry I forgot to take a before photo. 3 Floating Shelves (found here). Just make sure they are 12” so it will fit the items you want on it. A nice photo to hang either above it or next to it. And your done! Took all of 30 minutes to do! Makes me wonder why it took me so long! 1. No one can quite prepare you FULLY. Every child is different. Since I was having a boy after having a girl, everything felt new. The boy mom world is so much more different than the girl mom world. Also this was my first time committing to the breast feeding journey. My daughter had complications so we formula fed her. Approach it ready to learn but will a wee bit more confidence on what to expect. 2. Your Heart will expand to love them both. That was a main fear of mine. Like I loved my daughter so much and she got so much of my attention, how was I going to make sure she still felt loved. Be intentional. Right after Josiah was born, we planned a day of fun just for her and went to see Disney On Ice. Literallly like 10 days after I birthed him we made sure she knew she was still important too. I bounced back quickly after having my son so don’t do it too quickly, take your time. There are other ways to ensure the older sibling feels included. Just be intentional and plan for it before the baby comes. 3. Depending the age gap make sure the oldest has as much independence as they can muster up. Our kids are 25 months apart in age so my daughter had just turned two when my son was born. I wanted them close in age but she was still very needy. We worked hard to help her have as much independence as she wanted to have. She did good, but we were still very much involved as parents of two small children. 4. Plan dates night out and be super intentional about going on dates. It’s important that you don’t allow yourself to be easily swallowed up into the life of parents. Once kid number two comes everything becomes about them EVEN more. Make your time as a couple priority. Some days it just won’t work out but even if it’s sitting at the kitchen table having a nice ordered on lunch while the kids sleep. That’s better than nothing. They need you both to be happily married (or at least trying) in order for them to feel safe and secure. 5. Don’t compare your children. They both have unique giftings and callings. Allow them to prosper and evolve naturally with your guidance. 6. Encourage there relationship by letting them play together. Introduce them early, let the older sibling help. 7. How did you handle post-partum? What did you learn with your first that taught you more about yourself? How can you implement those lessons into baby number two? Great questions to thing about. One thing I wish someone would have told me is that, you’re more ready than you realize. You will find your way and with God on your side you will be the best mom ever. Each day will be a journey but remember this is such a blessed time. Enjoy these babies. They need you healthy, and happy. We had so much fun doing Josiahs 1st birthday cake smash photo shoot. I ever wonder why I paid for this with my daughter, but she was my first and we all know what those first babies do to us new parents. 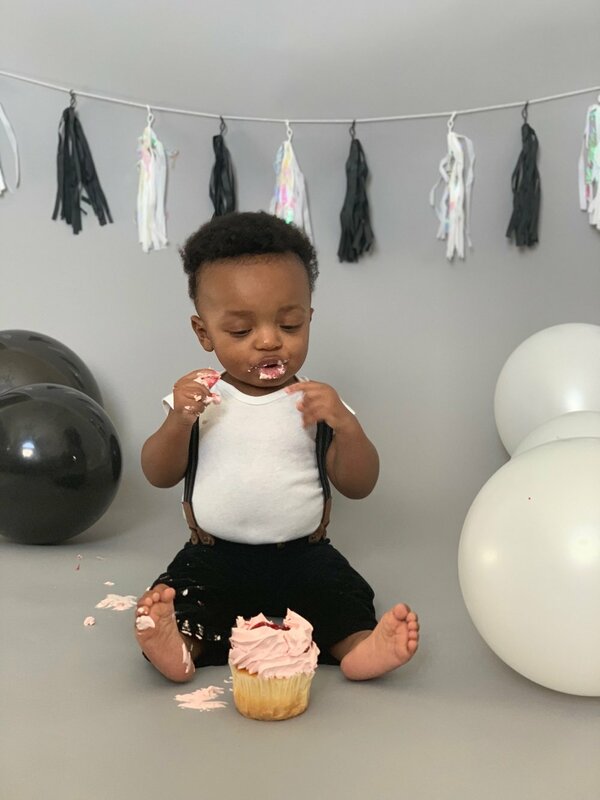 So here is how I did Josiah’s 1st Birthday Cake Smash Photo Shoot along with everything I used.. It was Black & White Theme. Find an area in your home that has great natural lighting and a wall that is parallel to that window. We used our dining room and moved the table out of the room. We kept the blinds closed so the sun wouldn’t be too bright for the photos. 2. The next thing we did is put up this grey paper backdrop that we got from Amazon on that wall facing the window. 3. After that we hung up this tassel streamer to add depth and character to the photo. 4. We blew up some balloons and started taking photos! We used these balloons and I take all my pictures and even my vlogs with this camera. 5. We got a LARGE cupcake from Target instead of destroying a whole cake. We got a cake topper that was super cute as well. 6. I downloaded LightRoom by Adobe on my cellphone app which is free to edit these photos. That’s it. Super easy and way cheaper! It was also super fun! Here are some photos to help you see how it all turned out. Have fun! The cutest kid to take photos of…..ENJOY! Tons of fun! HERE IS A VIDEO OF HOW IT DID IT IN ACTION! CLICK BELOW!